As we all know, the In-line declarations, operators and expressions available in 7.4 SP02 onward are taking the abap world by storm for last few years. For the new or the experienced abap-ers this is almost like fall ‘in-line’ or fall apart. 🙂 The main idea is to write code easily, keep it lean and compact as much as possible. But there is no end of debate that if the old school abap code is good enough to achieve everything then why complicate life ?Well with all that being said let us discuss about some simple best case scenarios of FOR expression which can seriously reduce no of lines of code and make it more compact. I feel this is one of the best addition among the new features ( Remembering old friend Mr. ‘C’ 😉 ). Situation 1: To move values from a source internal table to a target internal table which has all the fields of source internal table + some additional fields ( say ). *Define structure TYPES: BEGIN OF ty_struct1, field1 TYPE i, field2 TYPE string, END OF ty_struct1, BEGIN OF ty_struct2, field1 TYPE i, field2 TYPE string, field3 TYPE i, END OF ty_struct2. *Define table types TYPES: gtt_struct1 TYPE STANDARD TABLE OF ty_struct1 WITH DEFAULT KEY, gtt_struct2 TYPE STANDARD TABLE OF ty_struct2 WITH DEFAULT KEY. * Initialize source table with some random values DATA(lt_source) = VALUE gtt_struct1( ( field1 = 1 field2 = 'A' ) ( field1 = 2 field2 = 'B' ) ). *Use like simple MOVE CORRESPONDING DATA(lt_target1) = VALUE gtt_struct2( FOR lwa_source IN lt_source ( CORRESPONDING #( lwa_source ) ) ). cl_demo_output=>display( lt_target1 ). *Populate sy-tabix in the additional fields within the for loop DATA(lt_target2) = VALUE gtt_struct2( FOR lwa_source IN lt_source INDEX INTO index LET base = VALUE ty_struct2( field3 = index ) IN ( CORRESPONDING #( BASE ( base ) lwa_source ) ) ). cl_demo_output=>display( lt_target2 ). *Populate any value or call custom method in the additional fields within the for loop DATA(lt_target3) = VALUE gtt_struct2( FOR lwa_source IN lt_source LET base = VALUE ty_struct2( field3 = 10 ) "<<< Custom method/any value IN ( CORRESPONDING #( BASE ( base ) lwa_source ) ) ). cl_demo_output=>display( lt_target3 ). i) VALUE (Type of the internal table) is used for the in-line declaration of the internal table. Here structure and Type declaration is required before using VALUE operator. If you want to use VALUE # then type of the table must be already available and defined in the program i.e. the internal table need to be declared before. *Get details from DB table SELECT * FROM sflight INTO TABLE @DATA(lt_sflight) WHERE connid IN (17,555). IF sy-subrc = 0. *Prepare a range table DATA: lr_carrid TYPE RANGE OF s_carr_id. 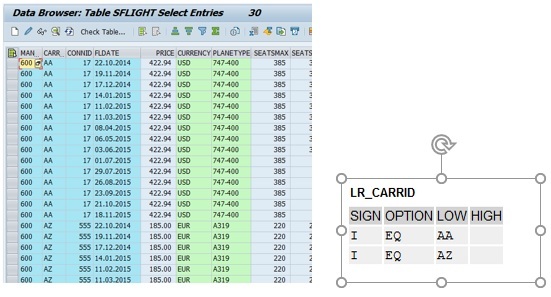 lr_carrid = VALUE #( FOR ls_value IN lt_sflight ( sign = 'I' option = 'EQ' low = ls_value-carrid ) ). SORT lr_carrid BY low. DELETE ADJACENT DUPLICATES FROM lr_carrid COMPARING low. cl_demo_output=>display( lr_carrid ). ENDIF. *Define the structures of header & item table TYPES: BEGIN OF comp, ebeln TYPE ebeln, bukrs TYPE bukrs, END OF comp. *Declare table type TYPES: gtt_comp TYPE STANDARD TABLE OF comp WITH DEFAULT KEY, gtt_header TYPE STANDARD TABLE OF ekko WITH DEFAULT KEY, gtt_item TYPE SORTED TABLE OF ekpo WITH NON-UNIQUE KEY ebeln WITH NON-UNIQUE SORTED KEY key_combi COMPONENTS ebeln. *Populate dummy values DATA(lt_header) = VALUE gtt_header( ( ebeln = '4500000027' ) ( ebeln = '4500000028' ) ( ebeln = '4500000029' ) ). DATA(lt_item) = VALUE gtt_item( ( ebeln = '4500000027' ebelp = '000010' netwr = '100' bukrs = 'IND' ) ( ebeln = '4500000027' ebelp = '000020' netwr = '200' bukrs = 'IND' ) ( ebeln = '4500000027' ebelp = '000030' netwr = '300' bukrs = 'IND' ) ( ebeln = '4500000028' ebelp = '000010' netwr = '999' bukrs = 'USA' ) ( ebeln = '4500000029' ebelp = '000010' netwr = '25' bukrs = 'GB' ) ( ebeln = '4500000029' ebelp = '000020' netwr = '50' bukrs = 'GB' ) ( ebeln = '4500000029' ebelp = '000030' netwr = '100' bukrs = 'GB' ) ( ebeln = '4500000029' ebelp = '000040' netwr = '150' bukrs = 'GB' ) ). *Now populate the values of Compor from item table to a new table DATA(lt_comp) = VALUE gtt_comp( FOR ls_header IN lt_header FOR ls_item IN lt_item WHERE ( ebeln = ls_header-ebeln ) ( ebeln = ls_header-ebeln bukrs = ls_item-bukrs ) ). SORT lt_comp BY ebeln. DELETE ADJACENT DUPLICATES FROM lt_comp COMPARING ebeln. cl_demo_output=>display( lt_comp ). i) VALUE (Type of the internal table) is used for the in-line declaration of the internal table. *Now sum up all the netwr for a particular purchase order LOOP AT lt_comp ASSIGNING FIELD-SYMBOL(<lfs_comp>). <lfs_comp>-netwr = REDUCE netwr( INIT lv_netwr TYPE netwr FOR ls_item IN FILTER #( lt_item USING KEY key_combi WHERE ebeln = <lfs_comp>-ebeln ) NEXT lv_netwr = lv_netwr + ls_item-netwr ). ENDLOOP. cl_demo_output=>display( lt_comp ). *Append new records in item table lt_item = VALUE #( BASE lt_item ( ebeln = '4500000030' ebelp = '000010' netwr = '1099' bukrs = 'CAN' ) ). cl_demo_output=>display( lt_item ). All the above 5 examples are simple and self explanatory. If you try them in your system I am sure it will be easier to grasp. If you have any questions let me know. There are tons of feature added with the new expressions and operators. Please feel free to add any other good use of FOR expression, if I have missed. I am planning to write more in this space like when to use FOR ( New ABAP ) and when to use LOOP ( old abap ) and related topics in future. Next How to use the “IoT” Map in the Multi Cloud Web IDE?